A rich and healing moisturizer packed with nourishment for glowing, soft skin. The essential oils of neroli and mandarin help to revitalize dull and lacklustre skin. I’ve had a problem with my skin peeling on my nose for years. I’ve tried everything, and I mean everything, moisturizers, exfoliances, masks, peels, even plain old Olive Oil – nothing worked long term. I’ve been using this for at least a year now and I don’t have a problem at all. Such a gentle but complete moisturizer. You don’t need much, so it may take some getting used to if you’ve used over-the-counter moisturizers. Goes great under makeup, not oily. Easily absorbed by my skin. Use it combination with the Flower Water for best results. If it’s really warm outside, I use it once a day. In the middle of winter, I use it morning and night. It must work really well…I’m 60 and people say I look 50!! This is a great product. I have sensitive skin and have been using this happily for several years. I can’t wait to put this product on my face at night!! It is silky smooth and I just love it!! I am in such appreciation for these beautiful products!! This is the best daily moisturizer I have used yet, With others, my skin ends up feeling dry in the middle of the day. This one really keeps it feeling soft all day! Also, I love putting it on! Rubbing it in my hands to soften it up! It feels so nourishing! Like I am doing something so healthy for my skin! This is such a treat to use. I am so thankful for this product. It lasts for a very long time and my skin feels well taken care of. This moisturizer is just excellent. It’s my ‘go-to’, and I have been using it for a few years. This is a quality product! My go to every day use for moisturizer. 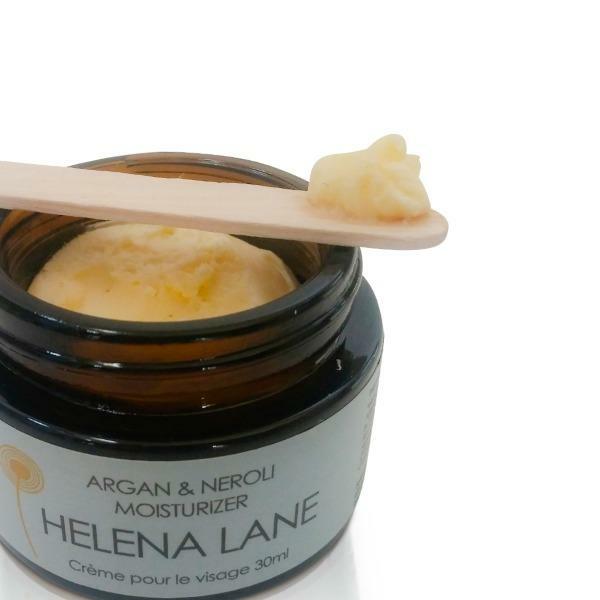 As with all Helena Lane products this is a great staple, daily moisturizer. I have rather sensitive (yet, ahem, maturing skin) and it took to HL products very easily and with no complaints. Feels luxuriously silky and rich and soaks in easily, no greasy residue. I use the moisturizer in the a.m. as my daily moisturizer and add a drop of oil serum to a pea size of moisturizer, for my night time routine. I have been a licensed esthetician for 30 years and soooo appreciate Helena’s true and accurate “less is more” philosphy and her all natural ingredients. Lovely moistuizer! I was afraid at first it would be too heavy and greasy, but just use a very little bit and once it warms on skin contact it feels lovely and lightweight. I use in the mornings and my skin looks and feels so healthy I often skip foundation now. neck. I use it after sprays of the Lavender and Mint Flower Water day and night. Love this moisturizer! It actually does what it is meant to do to start with and only a tiny about needed. But most importantly it smells and feels absolutely gorgeous so it makes you want to use it which is important for someone like me who is rather haphazard when it comes to looking after myself….. The smell of the essential oils used can actually change your mood they are so fresh and uplifting! Just took some home to my mum to try in the Southern Hemisphere where moisturizing is crucial along with some of the Chamomile and Calendula sunscreen! I love this moisturizer. It’s not too heavy and a little goes a long way! Once discovered I have not strayed from Helena Lane products. My skin is very dry, often feels burny and I am prone to hives. This moisturizer have given me soft, supple and happy skin. Love the product, but am concerned re contamination since there is no applicator and I have to use my fingers. Just make sure your hands are clean, and I use the back of my nail to lift it out, to minimize contamination. I have thought about providing applicators.. glad to have this feedback! As well as using Helena’s cleanser and serum I use the moisturizer as well. Wonderful for my maturing skin especially during our long, cold, dry Ontario winters. Ordering online was easy and efficient. I like the Argan & Neroli scent. Shea butter melts at body temperature so take a tiny amount (size of a grain of rice) and warm between fingertips before patting gently into skin, starting where skin is driest. Repeat and pat into neck and décolleté.